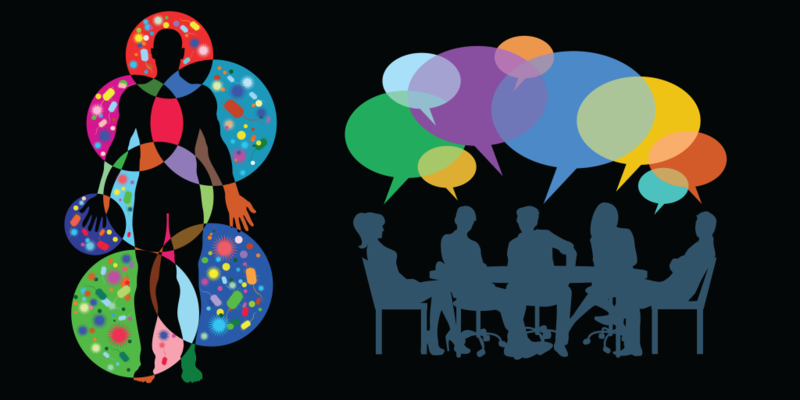 The BD2K Training Coordinating Center is organizing an Innovation Lab to foster new interdisciplinary collaborations among quantitative and biomedical researchers to address data science challenges in our understanding of the microbiome. The scope of microbiome, as defined here, broadly describes the corresponding high-dimensional big data derived from microbiota associated with a health or biomedical research objective. A more detailed description of the Lab can be found in the document Detailed information on 2017 Innovation Lab. Some exemplar areas of quantitative interest are suggested in the document Quantitative Topics of Expertise Needed and biomedical interest are suggested in the document Biomedical Topics of Expertise Needed. The Innovation Lab process entails participation in an intensive five-day residential workshop in order to facilitate the development of new teams of early-career biomedical and quantitative investigators who generate multidisciplinary cooperative research programs through a real-time and iterative mentoring process. The concept of the Innovation Lab program is to organize intensive multidisciplinary interactions involving around 30 participants, with the aim of developing new and bold approaches to address grand challenge questions for topics that could benefit from a fresh or divergent perspective. Prior knowledge of research at this interface is not required; rather, applicants with either quantitative or biomedical expertise who demonstrate their willingness to engage in collaborative multidisciplinary research are sought. Teams are highly encouraged to develop proposals for submission to the funding agencies after the conclusion of the workshop. Professional facilitators and senior scientists (mentors) with relevant expertise and exposure to the topic area assist the participants. The scientific experts serve as mentors and act as impartial referees during the process. Working under the guidance of the mentors, participants will form teams during the workshop to develop interdisciplinary projects to solve a data science challenge arising from a biomedical research question involving the microbiome. Learn about this year’s mentors here. The lab will include opportunities for learning about NIH and NSF funding through interaction with program officers. Applications will be considered from researchers in quantitative disciplines (mathematics, statistics, computer science, engineering, as well as other data-intensive areas including but not limited to finance, physics, climate modeling, and astronomy) and biomedical disciplines (including but not limited to biological, behavioral, social, environmental, and clinical domains). Researchers coming from a broad diversity of quantitative and biomedical backgrounds are encouraged to apply. Researchers in the biomedical domain must demonstrate their experience working with microbiome big data (e.g. data from sources including but not limited to whole or metagenomics analyses, transcriptomics, metabolomics, or other big data approaches involving microbial communities from human and/or other environmental niches with a health or biomedical research implication). A committee will select approximately 30 applicants to take part in the Lab. Selected participants will have their travel and hotel expenses fully covered by BD2K TCC. Applicants must be willing to commit to stay for the entire Innovation Lab.